If you haven't played the Mario game yet, then check out the video on YouTube. In the video you will see the final outcome of the first article in action. 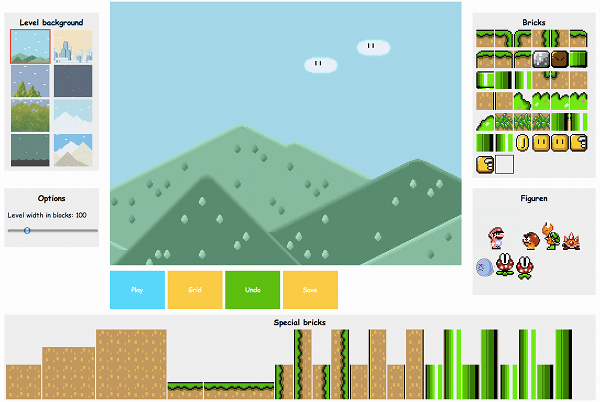 The two students of mine, which started the Mario project and did all the artwork (partly completely themselves, partly by finding free artwork on the internet and compiling those into spritesheets), did supply a level editor. Since we rewrote the game completely, embracing an object oriented approach, we will now try to re-use the classes we've written for the editor. Therefore the old editor - which was written well and contained features like undo, a visual grid and others - will not be presented here. Instead we will write the editor completely new using the same principles as in the first article. We can re-use existing objects to construct new and different ones. We've seen this principle by creating the StaticPlant and PipePlant classes. Those classes are inheriting from the Plant class. Both classes are therefore quite similar (they share some properties), but in their appearance completely different. Most of those rules are unnecessary for now, but will become essential later. Right now we just need the additional rule for the element with the #edit selector. This rule is the same as for the #game selector in the first article. Until now all we did was showing a part of the level. Before we introduce the possibilities of adding and removing items, we should somehow introduce the possibility to scroll (horizontally). We could do this with a scrollbar provided from the browser - a simple change in the CSS rules would be enough. However, must browsers add additive scrollbars, i.e. for a horizontal scrollbar we must therefore add a certain amount of pixels in height (which is about 20px). We would like to use a different scrollbar system, so that we will still just have the 480px as total height. We could write such a scrollbar control on our own, but to save time (and perhaps money) we pick a solution to suits our fits. The solution should be available as a jQuery plugin, since we already using jQuery and do not want to have extra overhead or complications with another library like prototype, mootools or others. There are several scrolling plugins available for jQuery, but most of them just fit for vertical scrolling (which is the most common case). After a long search we might end up with slimScroll, which is available at the author's website. This plugin is only made for vertical scrolling, since the author thinks that horizontal scrolling is a stupid thing and should never be wanted (apparently he did not know about the Metro design principles or our Mario level editor!). The restriction to horizontal scrolling can be modified by changing all lines in the plugin from the horizontal to the vertical part and vice versa. Showing the modified code here would be a waste of space, since the modifications are really small. Also the modified plugin is available in the download package. Now we can already see that the level being created completely. At this point we are able to see and scroll in the level we've decided to edit. What we did not inlude until this point is the ability to add new blocks or erase existing blocks. Therefore we will have to modify the code even further. Our first modifications will focus on adding some more classes to our application. First of all we create a class that will play an important role as a container for items to be added to the level. We will call this class ToolBox. The class also inherits from the Level class as the Editor did. We are also overriding some methods with dummy methods, to prevent usage of inappropriate stuff. An important feature lies in the load() method. Here we allow an optional argument called names to be passed. If this argument is passed, an array with names of items to be added to this ToolBox instance will be expected. This will be an important option if we want to have seperate toolboxes later on. If the argument has not been set, all available items will be added. The basic structure of this class follows the creations of classes like Enemy and Hero. We do not need a move() method here, since items inheriting from ToolBoxBase will be only used in the level editor. The first item that can be derived from ToolBoxBase is a rubber, i.e. an item that functions as an eraser for already added items. We will call this class just ToolBoxEraser and override the mandatory onDrop() method. Here we use the information of x and y to erase the item at the provided location from the level instance (which is in fact our editor). We return true to signal the calling function that no further steps are necessary. Additionally we want to have the possibility of adding some macro building blocks. Such blocks will consist of existing blocks and should speed up the level creation. We name the base class for all such objects ToolMulti and derive again from the ToolBoxBase. Here the onDrop() provides the functionality for all classes, that will be representitives from the macro items group. The basic functionality is that the item's view is removed once it's dropped on the level. We return false to signal the calling function that adding the item to the level is still necessary. How does creating a macro class for usage in the level editor now look like exactly? Due to our efforts in a proper object oriented hierarchy we do only need to call the base constructor with the appropriate arguments. Finally we give the class a unique reflection name - so that it will be added to the list of creatable objects. This also allows us to add it to a toolbox with specific elements only. Now that we have created the platform for having objects to add and erase, we only need to add the proper functionality in the Editor class. We have been already using methods, e.g. the setItem() method in the onDrop() function of the ToolBoxEraser class, which do not exist at the moment. Now we have to add these methods with the proper implementations. Since our macro objects will be width x height arrays of existing objects, we will need a more general setItems() method. Also we need wrappers around these functions, which perform some checks before actually calling setItem() or setItems(). The checks should involve scenarios like the addition of a second Mario (there can only be one player! ), if the proposed position is valid and if the onDrop() method did return true as value. The method removeItem() deals with the case of actually removing an item from the level array. We also added a helper method to remove the view of the item, which is about to be removed from the array. Finally we want to add a working undoList. We already prepared the array, and added some method call in the setItems() method. We do not need much code here, just a few functions to organize the list and a method to actually invoke an undo action. Now our editor is complete and can be used by some script. A demo of the editor is included in the download package. Basically the demo is build up the same way that the original game demonstration was built up. 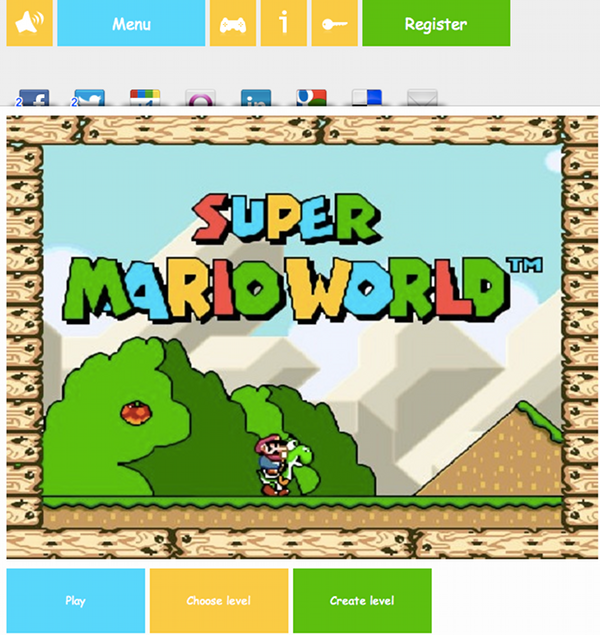 Now for any application using the Mario5 game source we need at least jQuery and the OOP layer. Since we are interested in controlling the game we also need an implemention of the keyboard class. If we want to have some sound we should also include a proper implemention of the sound class. If our application should provide the Mario5 level editor we need more sources. Additionally to the dependencies of the Mario5 game (and the game itself), we need jQuery UI and the jQuery slimScroll plugin. Providing all those scripts builts the bases for any web application. Since we are using the Entity Framework we can use it with any database provider by just setting a propriate one in the web.config file. Additionally we also save some extracted information from the JSON string. This is performed to save some computation power later, when a list of existing levels is requested. We should note that we have a direct DbContext access here, which should be avoided in big web applications. 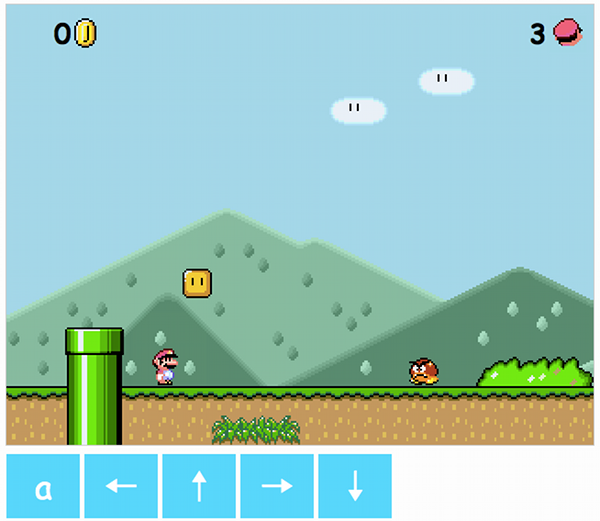 For our small web app surrounding the Mario5 game this is still acceptable. This code snippet wires up the button with the ID saveEdit with the proper ajax call. If the editor has a valid ID assigned, we use the URL to the edit action, otherwise we use the action we've shown above. The share buttons will be taken from a page called Shareaholic.com. On this page we can compile our own set of social bookmarks. Once we are finished the page gives us a snippet, which has to be included at our desired location within the page. Of course we will include the big three (Facebook, Twitter and Google+), but also Orkut, LinkedIn or more traditional services like sharing by E-Mail. Integrating touch friendly buttons is quite straight forward (for any web application). All we need to do is to make any link (or clickable element in general) big enough. We do not have to follow the Metro design principles guide here - but we can use some of the tips described in it. Those principles have been compiled together in the Metro design language document. Most importantly the top and bottom panel (responsible for displaying the menu buttons; the top navigation was really generic, while the buttom navigation always showed actions for the current content) have been altered. Now the content screen is always in the middle of the display, which could overlap the top and bottom navigation. Therefore the top and the bottom navigation had to be brought in front of the content screen. This is done by changing the z-index rule to a value of 10. The bottom row is also shown in the game (with buttons that can be used as touch input panels), which could (and probably will) result in overlapping with the game. To avoid restrictions in the game flow, e.g. 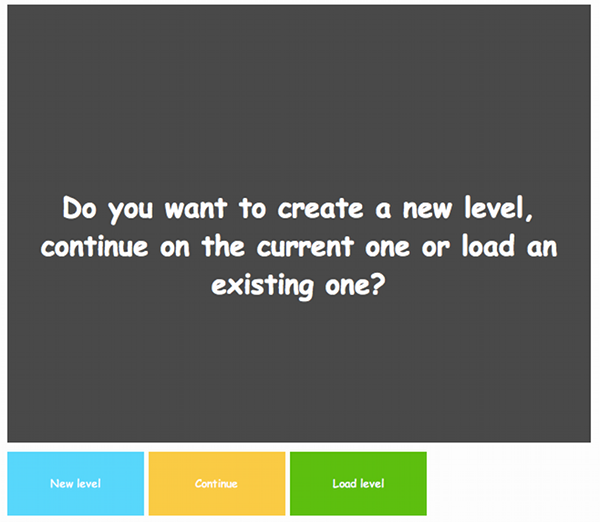 by not seeing the character or part of the level any more, the buttons have been made transparent. Here we just set the rule for opacity to a value that is lower than 1.0 (opaque). In this case a value of 0.8 should be sufficient. Another thing we need for such a platform are in-game sequences. Right now we just have one use for it: as a benefit for being victorious in the single player campaign. Note that the BigMario class could have been avoided, but those few lines are actually shorter than adjusting the usual class (Mario). 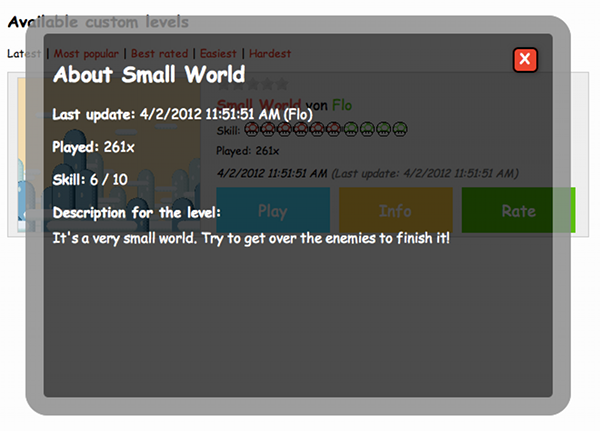 Also the new characters are added automatically to the level editor - which gives level creators new possibilities. Also one remark: Both classes only contain animations for running in one specific direction (left or right). This should be extended if one thinks about more sophisticated animations. So this is basically another implementation of the Level class. This time we rewrote methods like tick(), just to handle animations exactly our way (this excludes any hit-detections and other stuff, that is not required for our purpose right now). If we have a close look at the code we see methods like createSpeech() and createAnimation() pop up. Those methods have been created to ensure two possible actions in our animation sequences. name: 'bigmario', // what is the name of the character in the reflection array ? This one is tricky tricky tricky. CSS gurus found out a long time ago that the one property of the border rules is actually quite useful: they connect directly. What does that mean? Well, consider a simple square (let's say 10px times 10px). We now set a simple border with 1px on each side. Now our square is actually 12px times 12px (we use the standard CSS box-sizing now, not the IE one, i.e. the more intuitive one, which can be used via box-sizing: border-box;). This is simple. What if we set the border-top to 0px? Well we have a 12px times 11px box and the border on the left-top and right-top look a little bit smoothen. Now we increase the width of the border (but the border on the top side stays at 0px). We see triangles emerging on the top-left and top-right corners. Let's do something wired and lower the area of the box (going from 102 to simply 1). We see that this is going to be a triangle! OK: Long story short we can even set the area to zero (with 0 width a 0 height) and obtain a real triangle. Using this trick (and maybe various others) we can create a lot of possible shapes. A great page is online at CSS-Tricks.com. The OpenAuth integration is actually quite important because it decreases friction of the registration process. Some people just register for every page, but most people try to minimize their online account number by making only accounts where an account is necessary for them. One example would be the obligatory Twitter registration if one needs a Twitter API key. Even really straight forward registration forms (like the one used for the Mario5 platform) are obviously painful for most people. Therefore the OpenAuth helps a lot in animating users to try or use the web application. You can play the full version online at mario5.florian-rappl.de. The full article is available on the CodeProject. Created 8/7/2012 10:00:06 PM .